Learning to play the drums is an extremely rewarding experiences, regardless of age or experiences. It can unearth a hidden musical talent, be great fun and give a real sense of pride. Quite a surprisingly high number of our mature students have told us it helps them to relax. So if you have always wanted to emulate your heroes or just try something new, give it a go, it might just change your life!!! We currently have students ranging from six to seventy, so it's never too late. We offer lessons suitable for complete beginners to intermediate/advanced players, and typically lessons are tailored to suit individual requirements. For those who wish to gain graded examinations we also follow the Rock School Syllabus, although we can teach most graded syllabus. We are also well suited to help with school examinations. 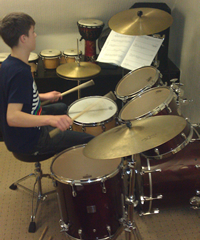 We use the best of drums and equipment to make lessons as stimulating as possible. 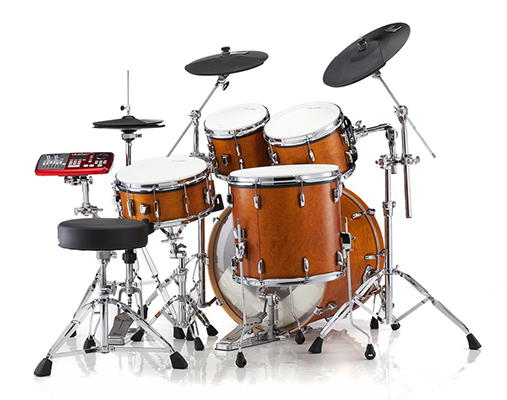 We use both acoustic and electronic drums depending on the student's requirements. Often, people are put off learning drums because of the noise and initial expense, but we have that problem solved. we have a small practise room available for our students, equipped with an acoustic set so there is facility to practice before you actually buy a set of drums. This allows you to guage if you are going to continue and if the most suitable type of kit for you is acoustic or electronic. We have a new Drum Kit Tutor - Neil Scollay. Neil Scollay drum tutor, vastly experienced drummer with over 15 years experience as a professional musician. Neil has played in many bands covering a wide range of genres and styles, and as a session musician. He currently plays for the internationally known Darth Elvis and the Imperials and some other well known local acts. "I am very passionate about teaching and tailor my lessons to each pupil. I have gained great experience through playing and teaching over the years and enjoy passing it on to aspiring musicians of all ages.